Welcome to this fantastic collection of brain-teasing word definition puzzles! Time to kill? Looking to train your brain and put those quiet moments to good use? 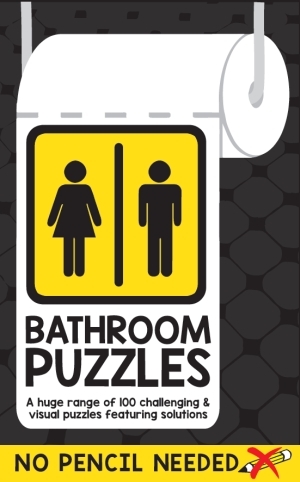 Bathroom puzzles are the perfect excuse to sit back, enjoy the peace, and puzzle on! 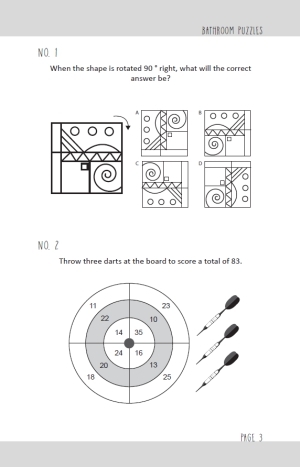 This book features 100 challenging brain teasers, uniquely created to be solved without a pen or pencil! All puzzles can be completed in your head, adding to the brain-training quality. Test your visual, memory and math skills with these fun and challenging games. How many can you correctly solve? Solutions are included towards the back of the book, so take a peek there and see how much of a genius toilet puzzler you are! We hope you enjoy our Bathroom Puzzles book, whether solved on the toilet or just when you want some mental stimulation and don't have a pen or pencil to hand - happy solving!